Current is fixed – you can’t ramp it up or down. 1. 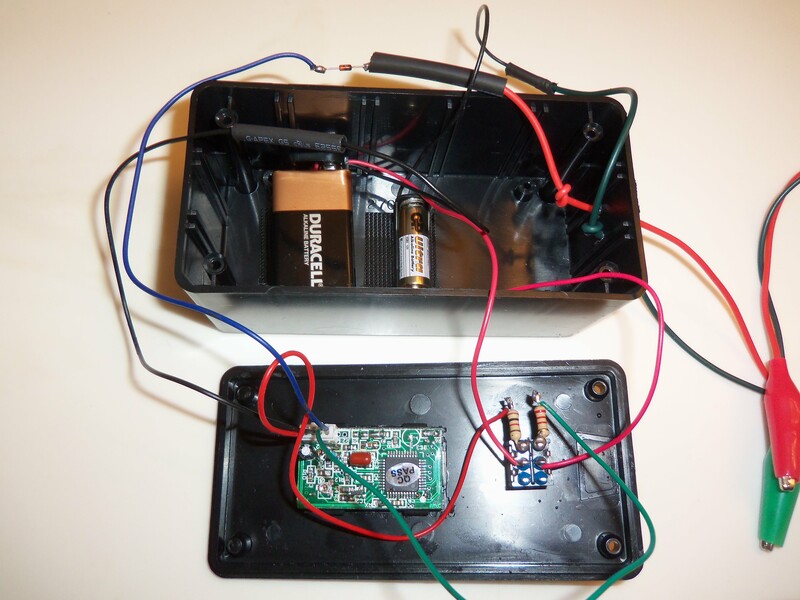 Use a single type 23A 12 volt battery instead of two 9 volt batteries. 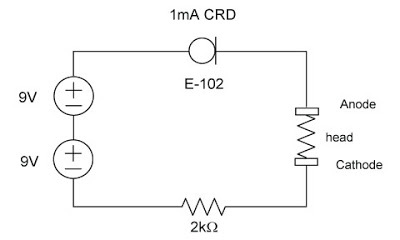 This limits CRD failure current to 12 / 2200 = 5.5 mA instead of 8.2 mA in Keith’s design. Neither is dangerous according to studies published on the web. Both would be very irritating and immediately noticable to a user! I do use a 9 volt battery to power the display (below). You can expect 3-6 months of battery life from the type 25a tDCS battery and a year or more from the 9 volt display battery given regular use. 3. Added a DPST switch to act as an on-off switch for the tDCS circuit and on-off for a separate battery and resistor to power the meter. The digital meter I purchased needs 5 volts to operate. 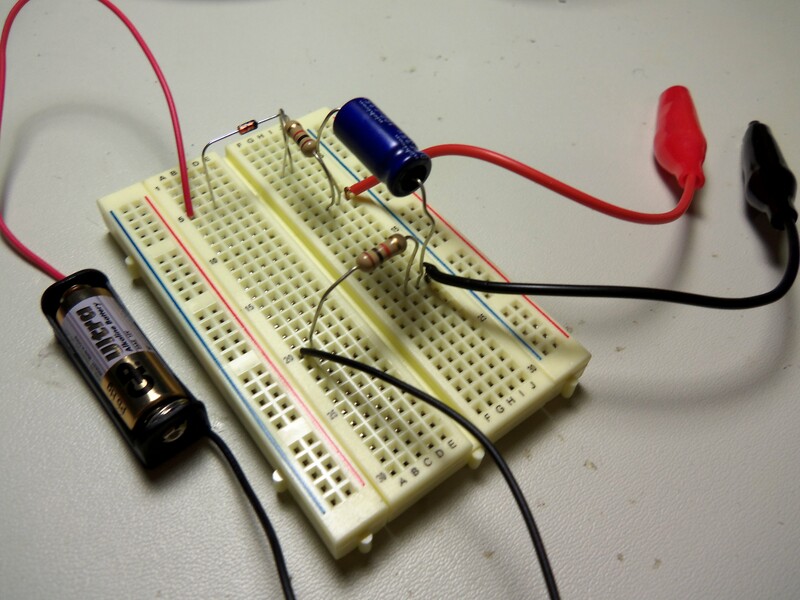 I use a 9 volt battery with a 1 k Ohm resistor in series to achieve the desired operating voltage. Before I built a “permanent” CRD tDCS device, I built a test unit using a breadboard. The type 23A battery is at the left side of the pic, the leads that go to the sponge electrodes are at the right. Follow the red lead from the battery and you will see the CRD. It’s tiny! In the breadboard example I used two 1 k Ohm resistors (what I had handy), one in series with the plus lead of the battery and one in series with the negative lead (instead of a single 2 k Ohm resistor in series with the plus lead. Either method is fine.) I also threw in a 100 uF capacitor (the blue cylinder) across the leads to the sponges to ease start-up and shut-down current. I did away with it in the final build – it didn’t seem that helpful. Close-up of the CRD. Note the black band is away from the plus of the battery. I decided to use a 1.5 mA CRD. Why? Studies posted on the web show that 2 mA is better than 1 mA for treatment effectiveness. However, it is my experience that 2 mA irritates the skin of many individuals causing them to cease using tDCS. As odd as it seems, backing the current off to 1.5 mA reduces reports of irritation to almost zero. For the final build, I used a RS project box I had on hand. You could build a CRD based tDCS device into something much smaller and more attractive. In the bottom left is the digital mA meter circuit. To its right is a DPST switch. The left portion of the switch is used as on-off for the meter. 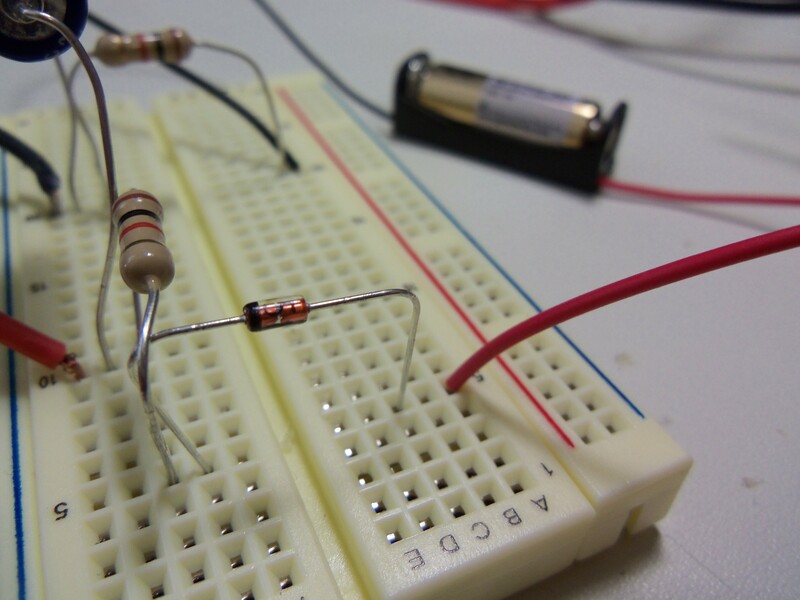 A 1 k Ohm resistor is in series with a 9 volt battery and the switch to provide the 5 volts needed by the meter. The right portion of the switch is the on-off connecting the 12 volt type 23a battery to the series connected 2.2 k Ohm resistor, the CRD and the electrodes. You can see the CRD at top-center of the pic, just before I placed heat-shrink tubing over it to protect it. Wires dressed, ready to close up the box. Completed unit with electrodes attached shows it’s regulated current level, 1.5 mA. So Where Do the Parts Come From? The case, switch, resistor, battery clips, heat-shrink tubing, and leads all come from Radio Shack. The CRD came from www.mouser.com. I used PN 954-E-152, a 1.5 mA CRD with axial leads. Be careful not to buy a surface-mount device unless you are well prepared to deal with one. The “3 digit Mini Blue LED DC 100mA meter” came from “Coldfusionx” via EBay. They are in California – not China – so delivery was quick. I use Amrex electrodes which are available via Amazon and other suppliers. By the way, I found the meter, as delivered, to be slightly out of calibration (it read too high). I was able to check and recalibrate it (adjustment screw) against a couple of DVMs. Total cost for this project was about $50. Keith’s design is as simple as it gets. If you want more flexible current control, you could add a selector switch and CRDs of different values – or you could use one of the many LM device designs on the web and build a tDCS device with fully variable control. Either way, tDCS is an amazing and wonderful thing. Please proceed with caution and read all that you can before attempting to build your own device – especially read safety related articles and papers! Best of all would be for you to seek out a medical professional like www.transcranialbrainstimulation.com . The information presented in this article represents an accumulation sourced from articles, papers, popular press, and other sources easily accessed on the internet. While evidence so far indicates that tDCS is very safe, your use of information in this article is completely at your risk. You are advised to seek out a trained medical professional for assistance with tDCS. I suppose I just use the flash at the beginning and end of the treatment, and the trust that the CRD works as it is suppose to, instead of an ammeter in line. Nice changes – any way you could post the schematic? Second question: any way you could take what you did above and post a schematic with a 3 stage gate switch that goes to a 1, 1.5, and 2 mA CRD? As background: I can read a simple schematic and breadboard it if the parts are listed precisely, but I don’t currently have the knowledge to know if minor alterations will cause significant problems. Thanks! I’ll try to diagram and post that in the coming week or two. Other blog posts coming first. Hi, I was wondering if you sell the schematics to this device or is it open source? If you sell them how much? And if it’s open source could you post a link please? I think this device looks the most professional and has all the safety requirements compared to anything under £300 that I have seen. I would dearly love to make this for myself as I suffer from slight depression but everything I have seen so far, well compared to this, doesn’t seem as safe. I couldn’t possibly afford the more expensive ones and I’m to frightened to try the cheap ones. So I hope I can get the schematics for this as soon as possible. Ps: This site is amazing. I don’t sell anything related to tDCS. I simply put on my blog what I learn about tDCS to share with others. The commercial tDCS devices are becoming more common and thus a little cheaper. If that is not feasible, perhaps someone you know could build a tDCS unit for you. I’m very new to all this and – as a severe Trauma/Depression/Add etc. sufferer – quite excited. my question is however, why can’t i just buy a 30$ EMS/TENS stimulator and apply the electrodes to my head? tDCS and TENS are not at all alike. Do some reading – at least on wikipedia. Awesome. I’m planning a slightly more complex variation of this, to publish as an opensource Fritzer schematic, with dual current (1.5 and 2.0), a test button, a larger capacitor for ramping, a 20V Zener diode for added safety just in case, etc. @Markus, in short because you don’t want brain damage. TENS is its own thing, and should be kept far away from the head. I’ve been thinking and planning. Also it seems that I misread the specs of the diode, 10V is just a reference voltage, the 1 and 0.5mA versions reach their peak current at 2V, which is perfect. hi i followed the convincing descriptions (thanks a lot to speakwisdom) and putchased foc.us instrument.which is on its way to me. i have foliwing questions:1.I have TINNITUS. Do you know about possible influence of tDCS instrument on tinnitus? When I am in the special situation/feeling that allows me to serve people in the “psychic” domain, I sense sort of electric currents in both my inner ears. And more – something happens to all my body. The closest to describe it – is close to an emotional event. But it is not exactly an emotional event. It does make me highly sensitive and very devoted to the person asking for advice/healing. Thanks for the post Brent! I am putting together an lm334z circuit that will incorporate the same 100mA meter you use in this post. I’m curious if your 9v + 1k ohm resistor method of powering the meter is working out for you. I don’t know enough electronics to know why or why not using the 9v would harm the meter. I asked the seller and he recommended just using 3 AA’s in series instead. So i did that, but it’s bulky and will be annoying if/when they need replacing. Please let me know how its going, if your not having trouble with yours then I will switch to a 9v. Thanks for all the great tdcs resources by the way. 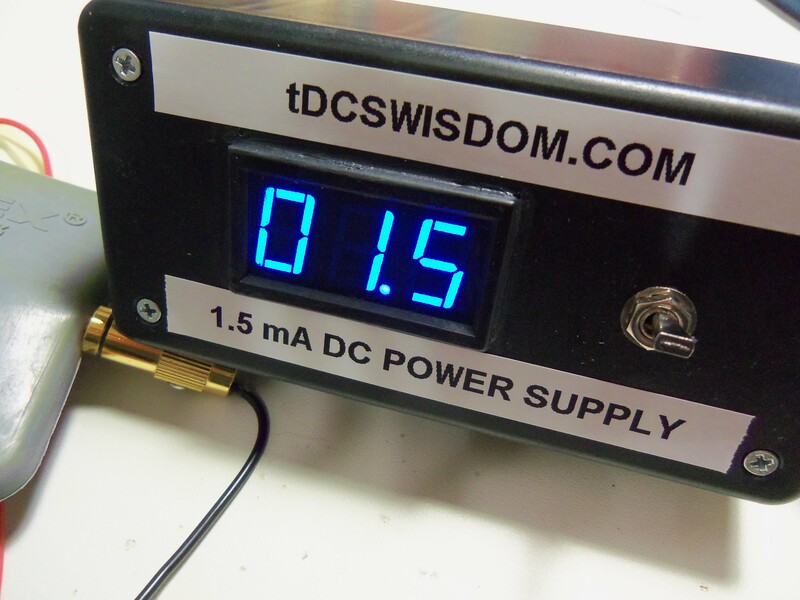 I’ve built two tDCS units in which I power the digital meter with a 9v battery with a 1k resistor in series. It works beautifully! So my digital meter seems to be unable to remain steady at the .1mA level. ie it is always jumping back and forth between 0.9 and 1.0 mA and behaves similarly at other current levels. I plugged in my dedicated meter and it doesn’t budge even at the .01 level. I was wondering if you had similar issues with your meter? If so were you able to fix it? Thanks. Excellent job and I’m looking to build the exact item you created in this post. I’m curious – is it possible to use a potentiometer in this setup? Sorry if this is a dumb question, but I’m not familiar with CRDs. I really appreciate all the information your blog has provided! 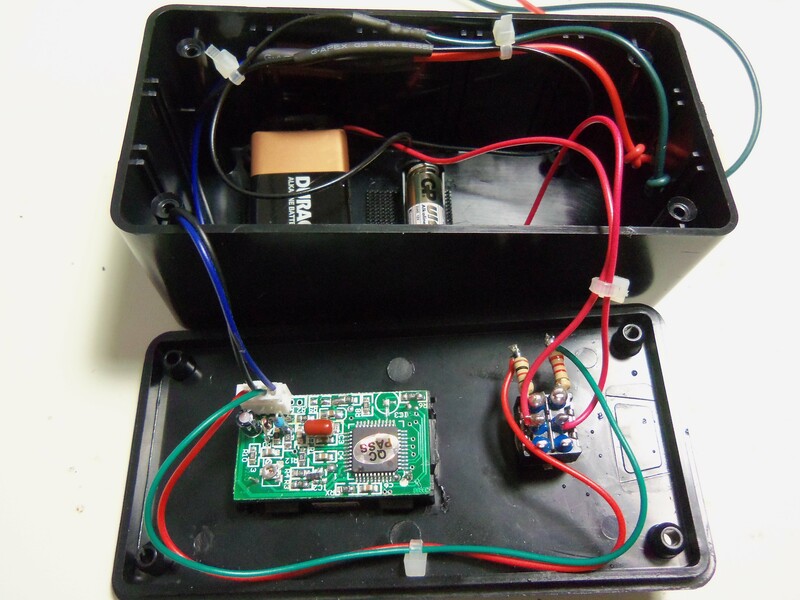 Pingback: Building a good tDCS device – part 1 | fsckYouBrain! hi thanks for the info ….I’ve started building one ….I’m confused over the references to the type 23A and 25a battery…. The correct battery type is 23a. The 25a is a typo. I’ll correct that. I’m using the Amrex Sponge Electrodes with a LM334z transistor regulated circuit, and I set up the whole circuit and the potentiometer works until i touch the multimeter to the Amrex sponges. The multimeter reads sometimes jumps and sometimes it’s uncontrollable using the potentiometer. We’ve tried a bunch of different saline solutions and taken it apart and put it back together and still can’t understand why when we touch the multimeter to the expensive Amrex electrodes the current becomes measurably unreliable…Help? Even with the sponges touching, you should be able to control the current – at 1, 1.5 or whatever current level you want. If that is not the case, then some component is mis-wired or has failed or there is a bad solder joint. Don’t use it until you are sure the current level is controllable and within the range you desire. Seek help from an electronics trained friend. Going to give this a try. Seems simple enough setup you did all the legwork for us lol. I have finished both the CRD(1.5mA) and the LM334. Very pleased with how they turned out. Still waiting on the electrodes to be delivered. One question though. I am using the a23 12 volt battery and get 11 volts at the electrodes on the CRD device and about 1 volt with the LM334 device. What’s up??? If you eventually use one or both, verify the current level while in use too. Ok, just found a picture of one with the bottom two rows as terminals and top two empty. I guess it just depends on the switch. You mention a 2-kohm resistor at one point and then later you say 2.2-kohm for the 12V series. I’ve only seen 2.2-kohm at the shack, so I’m assuming that’s what you mean. Is this correct? Correct. Electronics folks often leave off the decimal part of a resistor value because resistors come in a fixed set of values. Shorthand – sort of. A word of warning; it’s been said on another site that using an output ramping capacitor can be dangerous because with poor connections or no connection (re:load) the capacitor can slowly or even quickly charge up to close to the battery voltage which could be dangerous. If I build one I’ll use a pot to slowly ramp the current up and down.